I remember my first day in 4th grade. In a few moments, I would come to know that I had my first male teacher, Mr. Netz. I attended an elementary school in St. Peter, Minnesota and my baby brother, Daniel would be born in the spring. But on this first day of school - I finished my last few bites of Kix cereal at the breakfast table and was being quietly informed about the rigors of 4th grade from my Dad, Gary L. Woodward. "Today's the big day - right Joanie? ", my Dad said with his characteristic gentleness. "Ya, I guess so...", I hesitated. (No matter how well I did in school - I always had a fear of not being good enough to get in the next grade.) Dad taught at the college down the road, at Gustavus Adolphus, and our elementary school was right across the street from our house. The school was so close, in fact, when I was home on a sick day I could watch kids in class right from the big green and gold couch by our living room window. Unfortunately, most of my classrooms were in the back of the school so I never got to watch "my class". My Mom and I had argued earlier that morning. She wanted my hair up in pig tails way, way up on my head like a baby but I wanted mine low - like I saw Laurie Partridge wearing on T.V. 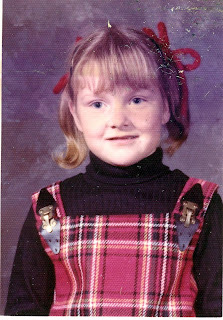 In third grade I wore very high pigtails but I was arguing like mad to look older. 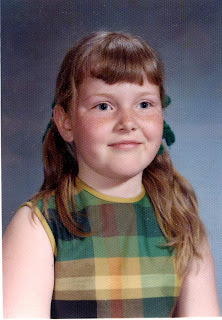 While they were not low enough for me - I won some ground in the "pigtail war" and Mom shot me dirty looks and snarky comments all morning. This was nothing new - Mom and I were always at odds. My Dad leaned forward at the kitchen table, steam rising from his coffee cup and Mom doing dishes behind him. "Looks like a great day", he said. "Now that you are in fourth grade there is something you ought to know." I leaned forward too - our heads close enough to hear over the hiss of water pouring into the sink. "The first three grades are all about obtaining the requisite skills to learn. Basic reading, writing and and arithmetic - see...", my Dad paused. I nodded but I didn't understand. "But now you are going to use all of the skills from the prior three grades to help yourself learn. This year you move away from acquiring basic skills and toward becoming a scholar, he sat back." "Today I am a scholar." I repeated. "Precisely", he said with a smile. Althought I didn't quite get the concept Dad was putting forth - I gathered my lunch from Mom in my Scooby Do lunchbox, adjusted my polyester "first day of school" outfit and skipped to across the street to school with my sister, Janis. I took my Dad's advice and when Mr. Netz had his daily half hour of craft time I asked for additional books to read because I was a scholar. In fact, I told all of my teachers that I wanted to achieve the goal of being a "scholar" this year and the inevitable straight A's were the result. My Dad was right and it made sense because he was an education professor. I thought of Dad in 2007, when I learned that school kids today are expected to learn all basic skills by grade 3 instead of grade 4. Scholars are born a year earlier now :-) My Dad would be impressed.